I'm really proud of my homegirls at work for branching out into non-Americanized Chinese joints. Recently, I took them to Earthen in Hacienda Heights where I ate my latest MEOW (that's MEal Of the Week for those of you joining us late) and although they each ordered chow mein for themselves, they did try some of the delicious house chicken and green onion pancakes that I ordered. "Try some," I said, pointing to the perfectly golden brown pancake in front of me,"it's a green onion pancake." "Do you put syrup on it?" Whether or not that question was a joke I don't know, but I simply led by example and took a bite of one of the triangular slices sans syrup. 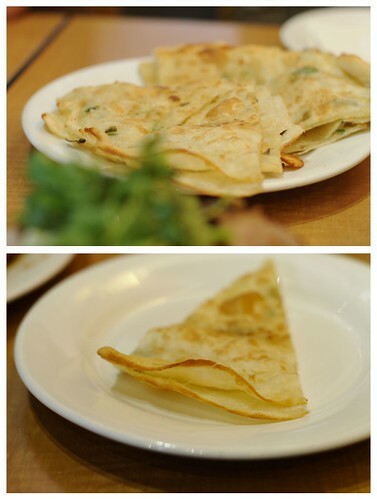 Thin and crispy, the pancake glowed with hints of scallion and fresh oil. My friends followed my lead, and ended up thoroughly enjoying this savory Chinese staple that I had introduced them to. Since cold chicken anywhere outside of a salad was a novel concept to my coworkers, I don't think they quite got that the House Chicken I ordered was supposed to be chilled. Marinated in a spicy-garlicky-vinegary sauce and laid over some crisp cucumber, the cool temperature of this Shandong-style chicken dish actually enhances its flavor. A perfect dish for a typical hot Southern California day. We got back to the office and I heard that my friends had told some people about Earthen and that they liked it. Another day, another job well done. Very nice! I think I'll go check out Earthen myself now. Speaking of green onion pancake, have you tried Paul's at WoFo? Well if you haven't maybe you can on wed. I can't believe that your co-workers had never tried a scallion pancake! And asked if you put syrup on it! I wonder what your co-workers would think of the thousand year old egg dish they have! Delicious by the way.